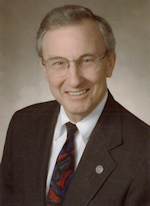 The Honorable Harvey B. Morgan, legislator and pharmacist, retired in 2012 from the Virginia General Assembly after 32 years of service to his District and to the people of Virginia. His tireless legislative efforts and accomplishments have been recognized and honored by countless organizations. The Virginia Pharmacists Association (VPhA) Research & Education Foundation has established an Institute of Government & Public Service. There is not a more fitting tribute to Harvey Morgan than naming the Institute in his honor: The Harvey B. Morgan Institute of Government & Public Service (Morgan Institute). Likewise, there is no one better to lead the Institute than Harvey Morgan himself, and we are grateful that he has generously agreed to guide the Institute’s good works. Harvey will be assisted by individuals with expertise in healthcare policy, advocacy, practice, and education. As policy makers grapple with historic state and national challenges in healthcare, the VPhA Foundation envisions a better-informed citizenry, including public officials and pharmacy professionals, and an enhanced quality of life for all Virginians. In keeping with this vision, the VPhA Foundation is establishing the Morgan Institute to provide education and information on topics related to health care. The Virginia Pharmacists Association Research & Education Foundation (VPhA Foundation) envisions a better-informed citizenry, including public officials and pharmacy professionals, and an enhanced quality of life for all Virginians. In keeping with this vision, the VPhA Foundation is establishing the Harvey B. Morgan Institute of Government & Public Service (Morgan Institute). The Morgan Institute will provide education and information to citizens, public officials, and pharmacy professionals on topics related to healthcare. Contributions by individuals, industries, and the pharmacy profession will provide operating support for the programs and services of the Morgan Institute. The Institute is an initiative of the VPhA Foundation, a 501(c)3 tax-exempt corporation. Gifts large and small will enrich learning experiences and quality of life for Virginians. We are grateful for the generosity of friends and colleagues, and your gifts are tax-deductible. The Harvey B. Morgan School of Government & Public Service is eager to serve the people of Virginia. With your help we can accomplish so much more than we could alone. Thank you. Your contribution to the VPhA Foundation, a 501(c)(3) organization, is deductible as a charitable donation for income tax purposes (Tax ID# 54-1142544). 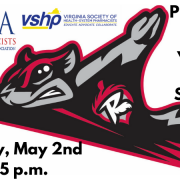 Please contact 804-285-4145 or Foundation@virginiapharmacists.org if you have any questions. You may make a donation by printing VPhA Foundation’s contribution form. A native of Gloucester, Morgan was graduated from Gloucester public schools; Hampden-Sydney College, BA; and the Medical College of Virginia, BS in Pharmacy. He served in the United States Navy. Until 1990, he was co-owner with his father and brother of Morgan’s Drug Stores in Gloucester and West Point. 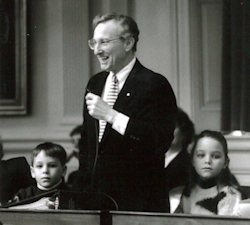 First elected to the Virginia House of Delegates in 1979, Morgan represents the 98th Legislative District, which includes all of Essex, Gloucester, Mathews, and Middlesex, and portions of King and Queen and King William Counties. He has served with nine governors, received numerous gubernatorial appointments, and chaired multiple committees and commissions. Morgan has received scores of leadership awards and commendations from state and national organizations in recognition of his legislative efforts and accomplishments. Virginia Commonwealth University conferred the Honorary Doctor of Humane Letters degree to him in 2008. Morgan is an elder and has served as deacon, choir member, and teacher in the First Presbyterian Church of Gloucester. He is married to the former Mary Helen Osborn and has one daughter, Gayle Morgan Vail.